……”Bring on the cavalry”, you’d be dead wrong. Also if you’re thinking of the English Civil War. A “Kavalier” is an architectural term, being a firing position integrated into and higher than a defensive wall. This being Mayence, stuff frequently gets a Francophile flavour as evidenced by the spelling. 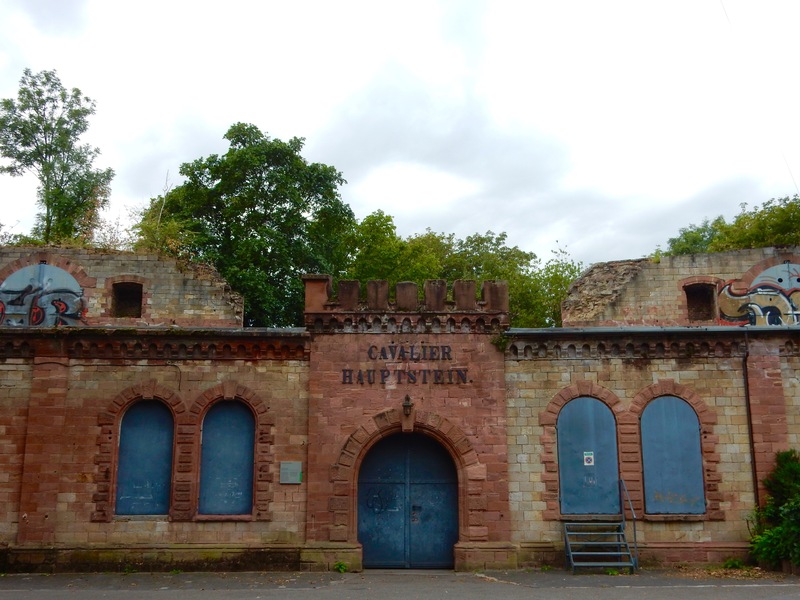 This is the Hauptstein Cavalier, part of Mainz’s defensive fortifications and first erected in 1632 as a wooden pallisade and earth wall by the Swedisch occupation forces against the (help me here someone….) forces of the Holy Roman Empire who were determined to prevent the spread of protestantism in their hood. Thirty Year’s War, in other words. Between 1710 amd 1731, Prince-Elector Lothar Franz von Schönborn ordred the building of a second string of defensive forts and walls, this being one of them. 07 Aug	This entry was published on 7 August, 2015 at 08:00 and is filed under Architecture, History, Mainz. Bookmark the permalink. Follow any comments here with the RSS feed for this post. Older: Cleanliness supposedly being next to godliness…..
Is this place closed and shuttered to viewers? The murals look like graffiti.